Raphael and Alopex are scouting a mysterious building. Apparently, a number of animals have been stolen from pet shops lately and Nobody tracked them to this place. However, when she tried to get a closer look, a high tech security wall nearly fried the circuitry in her suit, thus requiring a lower tech approach. Raph and Alopex spot scorpion-mutant Zodi unloading a fresh shipment of stolen animals and they decide to move in. Sneaking inside, they find that the building is actually a huge lab wherein new mutants are being grown. Wanting to learn more, they find a computer terminal and Raph takes a guard hostage, trying to force him to log in. The guard turns out to be a Homunculus of Null's design and puts up a tremendous fight. They defeat it, but their presence is alerted to Zodi. After a scuffle, Alopex takes Zodi hostage and tries to convince her to leave her enslavement at Null's hands. Zodi escapes and reveals that she's not enslaved, but on the payroll. Raph interrogates her and Zodi states the obvious, that Null needs fresh animal specimens to make more mutants and it's easier to steal them from pet shops than hunt them in the wild. It all turns out to be a stall tactic, though, as the door opens and another Null mutant, a snake-creature, comes slithering inside. In the ruins of a city, the Rat King celebrates the extermination of all life within. With nothing left to do, he returns to the Thin Place and receives intel from his thousands of rat minions. One rat tells him something interesting and he decides to investigate. Returning to Earth, he finds New York City in chaos and celebrates. He orders his rats to scour the city and find the weak and helpless, as he wants to have fun with them. *This issue is continued from TMNT Universe #18. 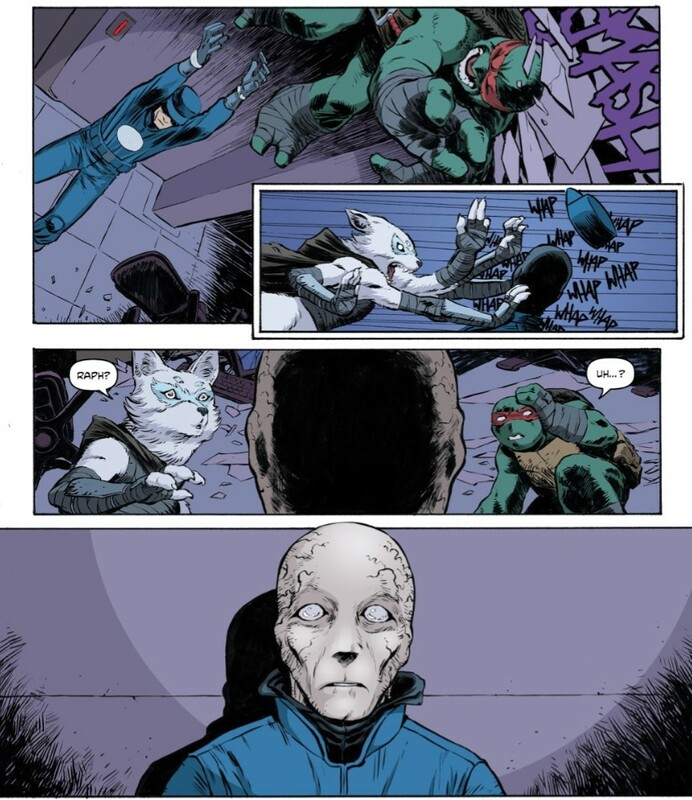 The story continues in TMNT Universe #20. 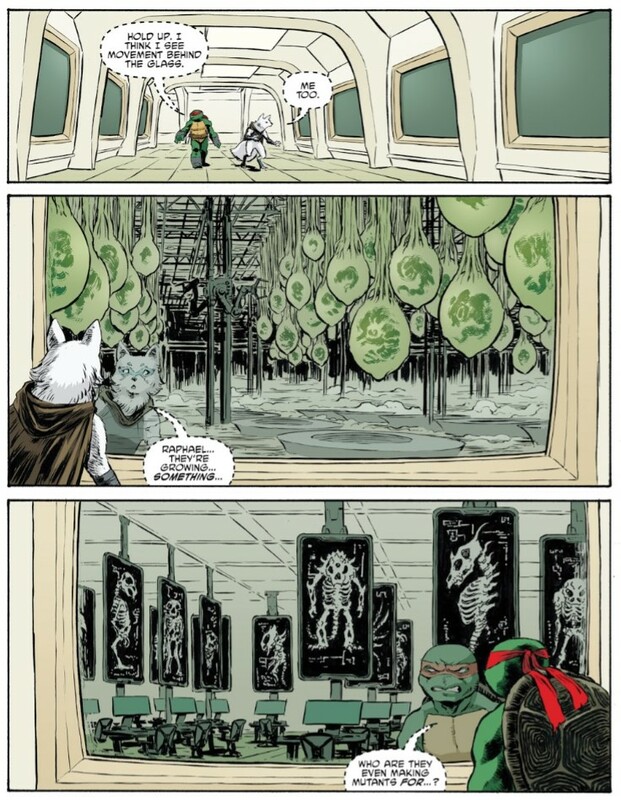 *Editor Bobby Curnow suggested that "Service Animals" takes place just prior to TMNT (IDW) #73. 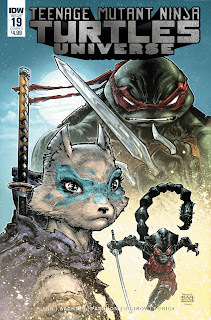 *The back-up takes place between TMNT (IDW) #80 and TMNT (IDW) #81. 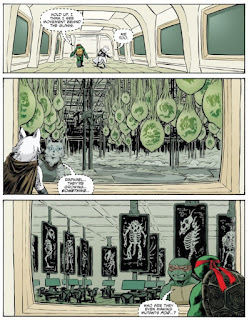 *The Turtles last encountered Zodi in TMNT Universe #4. *This issue was originally published with 3 variant covers: Cover A by Freddie E. Williams II and Jeremy Colwell, Cover B by Dave Wachter, and Incentive Cover by Raffaele Ienco. The relationship between Raphael and Alopex is one of those things the IDW comic has been trying to develop over the years, trying, but they just haven't had the time for it. When you've got so much plot development going on nonstop, character development winds up taking a back seat. Raph and Alopex are supposed to be an item, but they hardly ever spend any time together. "Service Animals" looks to be trying to give the pair the alone-time they've needed to better sell their affection to the audience. What's nice is that the script doesn't try to push any lovey-dovey stuff in the dialogue or their interactions, either. It isn't trying to force this relationship between them, and in fact, if you didn't know that previous stories had been attempting to hook these characters up for years, you likely wouldn't have even registered a romantic undercurrent. Instead, Raph and Alopex trade cute banter and act casually around each other. So if read in vacuum, it seems like they're just good friends, but if you've been reading the series for years, you can subtly interpret more to it than that. It's the best possible approach; by not trying to oversell their relationship, it feels much more sincere. This is Ian Flynn's first issue for the main IDW TMNT continuity, though he's previously provided scripts for their more kid-centric TMNT comics based on the Nickelodeon cartoon. It's a different side of Flynn's writing than I've seen before, as I've only read his Nick TMNT and Archie Sonic the Hedgehog and Mega Man comics, which were all funny, colorful and cute. He switches gears to fit the tone of the main IDW TMNT series and doesn't bring his funny kid's comics baggage with him. There's a scrap of humor, such as a two-page pantomime sequence where Raph and Alopex silently argue about how to navigate the building, but it isn't overblown or suffocating. 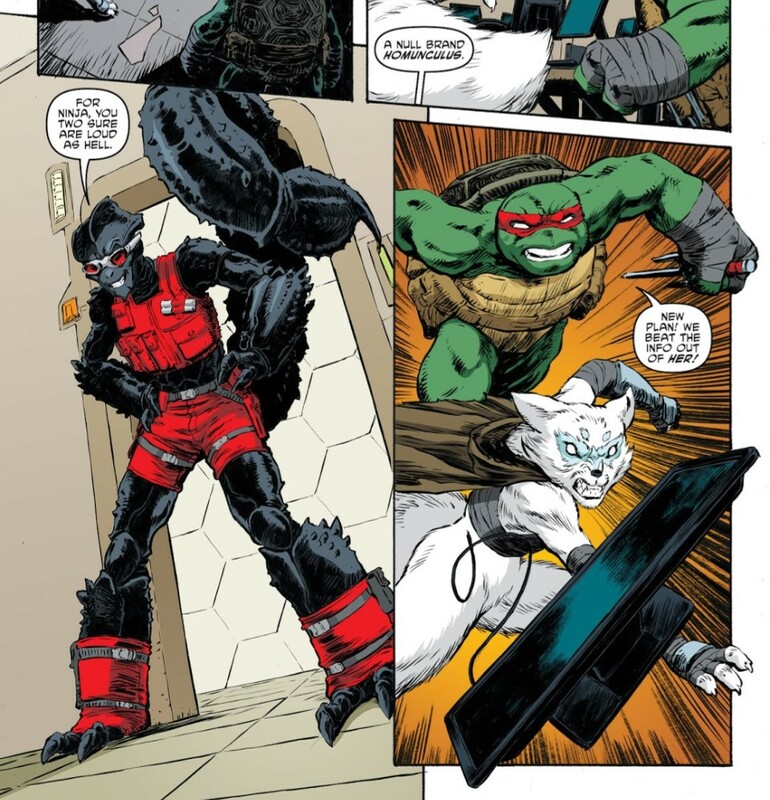 Rather than feel like the characters are doing a bit, the humor comes mostly from the circumstances as they organically unfold, such as both Raph and Alopex realizing that neither of them have the tech skills to get past a login/password screen on a computer terminal. And Flynn manages to go an issue without sneaking in Easter egg references to TMNT minutia or memes, which is a relief. I enjoyed his Sonic and Mega Man stuff, but at times he really drowned those comics in pithy, self-aware references. And on the note of ruined cities, "Kingdom of Rats Prelude" is a back-up I want to like, but am having trouble finding a reason to like it. The story is exactly what the title says it is: A teaser for an upcoming storyline in the ongoing series. 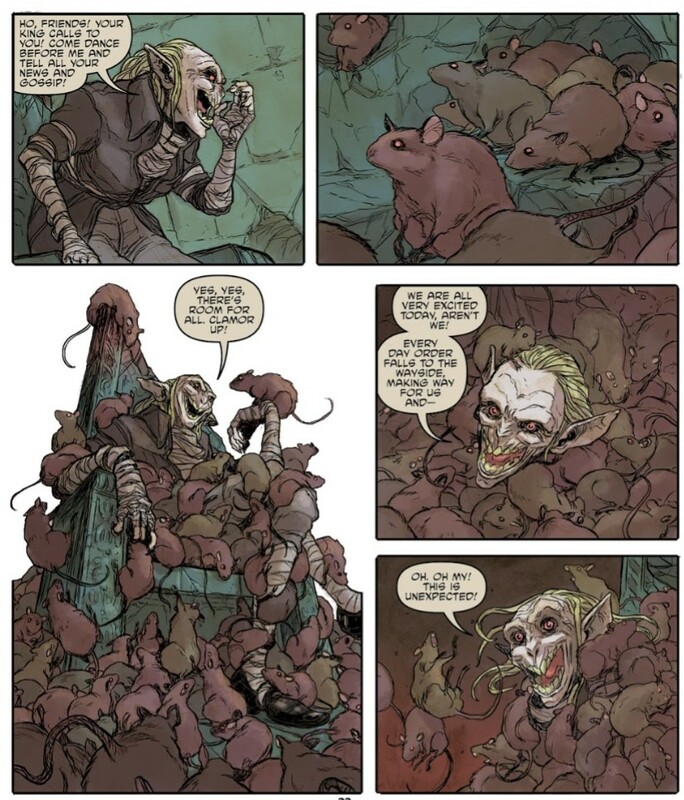 I mean, I LOVE the Rat King, he's my favorite TMNT villain, but all he does in this back-up is tell customers to buy the ongoing because there's about to be a storyline in it starring him. The back-up isn't a story in itself, but a trailer for something else. 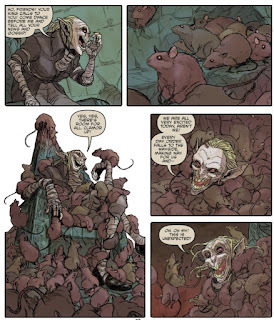 Great art from Tunica, especially the way the Rat King slips in and out of impossibly small spaces; very creepy. But in the end, it's a teaser that doesn't tell you anything more than what the title of the arc does. "Service Animals" is looking to be a good two-parter. The Null storyline has been perhaps the most neglected of the villain arcs in the IDW series since they began it three years ago; it's updates have been random and small. That's kind of worked in its favor, as it hasn't been constantly making promises and then stringing them out for years like the Pantheon stuff. Instead, it just sort of has been popping up and then disappearing. You forget about it for a while, then when it intersects with the storyline again, you go, "Oh yeah. Null." I'm not expecting too much major plot reveal, but we might get some cool new mutant villains out of the deal. Was the snake at the end Scale-Tail? I dunno. Maybe. I get what you mean about Raph and Alopex not having enough consistent development and Alopex having no one reliable personality. Flynn's approach here is good - I loathe over-the-top shallow love interests, and the 2012 TV series' Raphael and Mona Lisa was one of the absolute worst in that regard. If you're going to write two characters in love, give them actual depth and chemistry - make us believe - and fanservice is more of a cheap sop than a meaningful substitute. It also makes me think of what you've said in the past about Ninjara - by the time she left, she still didn't have enough individuality in the group, mostly cooperating in group fight scenes and saying lines anyone else could have been saying. But I have to disagree on one point - I rather like Sophie's portrayal of Alopex, especially in her "Secrets of the Ooze" webcomic where she's both moody and catty. And the single best line in Service Animals so far was uttered by Alopex: "I swear Splinter trained ninja instead of samurai." It made me laugh repeatedly, not just because of IDW Raph's impulsiveness, but it can be interpreted as a subtle easter egg alluding to all the versions of TMNT where the turtles typically loudly spring into combat and don't bother with stealth. I have a theory about the state of the city's destruction in (and possibly after) Invasion of the Triceratons, pending the completion of that story: New York City is a big place, and most of the conflict seems to have taken place in and around the island of Manhattan, with reports that traffic arteries between the island and the rest of New York were being destroyed with only the Brooklyn Bridge remaining. It's entirely possible that large parts of the city further afield have been left largely unscathed and still functioning, like maybe large portions of Bronx, Brooklyn, Queens and especially Staten Island, not to mention the major cities on the Jersey side of the Hudson. The greater metropolitan area is a big place, and Null may not be based in Manhattan at all; I seem to recall at least some of her operations have been in New Jersey. If you like this side of Ian I highly recommend New Crusaders. It only ran for six issues but it was awesome. I'm really glad this issue is good. The cover art is awesome, but as soon as I saw this issue I thought about how nauseating it would most likely be. Like you've said, portrayals of Alopex have been inconsistent, and she's been so damn boring since her heel turn. It is really encouraging that this issue puts her characterization on a good path. Mark, are you planning on reviewing the Inside Out Director's Cut? One of the things I really disliked about the Archie series was the way that all of Raph's character development revolved around Ninjara, and how their relationship was constantly shoved in our face despite her not really having a real reason to exist. So I much prefer Raph and Alopex's maybe-they-will-maybe-they-won't relationship, because it can be read as a very close friendship OR a potential romance (depending) and they both have lives and existences and development apart from each other. And showing them just being comfortable around each other works on every level.